Welcome to the home of the South’s best Fabrication Company. We have a talented staff to provide your company with service in all aspects of fabrication, construction, and industrial maintenance. We want to be your go-to-company, when the job needs to be done and done right! Our line of Papa's Little Cookers, are one of our proudest acheivements. We build strong, long-lasting, quality cookers that will definitely stand the test of time, and aid you in creating some of the best cuisine possible. 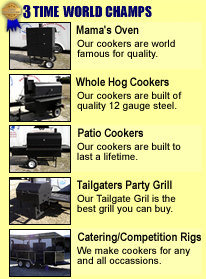 Maxey's line of cookers are world famous and three-time world champions. Cookers are our business, not our hobby.